If you take 38 cast members, 26 crew members, three directors, 39 rehearsals, six Saturday shop calls, 47 gallons of paint, 40 costumes, and five scenic locations, and add them all together, you get Wakeland High School Theatre Department’s production of “Peter Pan.” The theatre department has been hard at work since the start of the school year in order to put on a great show. J.M. Barrie’s 1904 play was adapted into the musical WHS is performing. The show features music by Mark “Moose” Charlap, Jule Styne, with lyrics by Carolyn Leigh, Betty Comden and Adolph Green. Show times are 7 p.m. Thursday, Friday and Saturday, and 2 p.m. on Saturday and Sunday for a total of 5 performances. So Join Peter Pan, Wendy, Michael, John, Captain Hook, Mr. Smee, Tiger Lily and, of course, the Crocodile on their adventures in Neverland as they tell the tale of the boy who won’t grow up. Please see attached file from the Booster Club. All orders and money are due by the end of the day this Friday, December 6th. Rehearsals on December 9th, 10th, & 11th will run late and the boosters are providing you with the opportunity to purchase meals for each evening for your student. This program is optional and students who do not sign-up will need to bring their own meal each of these nights. We plan on providing meals from Chick-fil-A, Subway and Little Caesars. Water will also be provided. The cost for all 3 meals is $21. Please pay with check made payable to Deborah Stanislaus, the booster VP. The attached form and your check must be returned to the Black Box in the theatre room no later than this Friday, December 6th at 4:30pm. If you have any questions, please contact Cheryl Doerr using the contact information contained on the form. Attached is a prop list for Peter Pan. This is the area of the production where we are struggling the most unfortunately and we are having a hard time rounding up a lot of this stuff. Any help you can lend would be greatly appreciated! 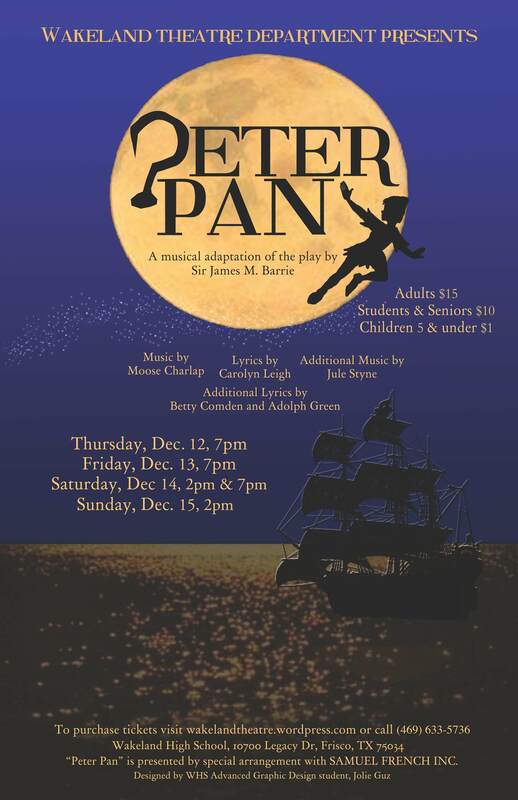 Peter Pan Shop Call this Saturday, November 2nd! We will be holding our second Saturday shop call this weekend (that’s November 2nd), from 10:30 until about 3:00. Please bring your lunch with you, or have plans for a parent to drop one off in the afternoon. We would like to limit the number of students coming and going for safety reasons. Parents are welcome to come up and help get the show built as well!